Marius Preda is a multi-instrumentalist that has earned the respect and lauding of other musicians for his mastery and power on a multitude of instruments he performs on. 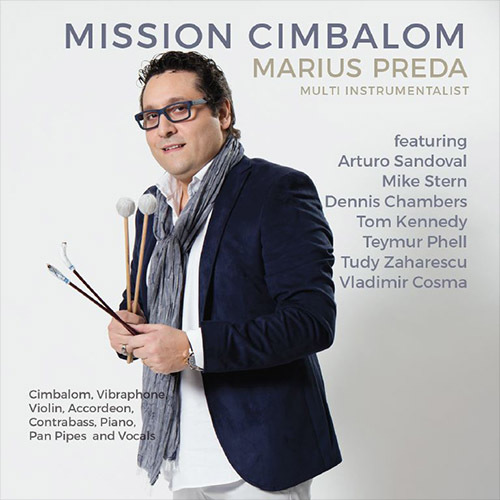 Ten time Grammy Award Winner and trumpeter Arturo Sandoval explains it best, “Marius is a gift from God for our own enjoyment.” His latest album is titled, Mission Cimbalom, which Sandoval and Vladimir Cosma both were involved with the production of Mission Cimbalom. Cosma explains, “Marius is one of the best musicians that I have worked with during my entire music career.” Preda has developed a new way of playing the cimbalom, as a result, he has become the first cimbalom player in the history of Jazz. The cimbalom is a concert hammered dulcimer played by striking two beaters against the strings. The steel treble strings are arranged in groups of 4 and are tuned in unison. The bass strings which are over-spun with copper, are arranged in groups of 3 and are also tuned in unison. Mission Cimbalom features a list of top-notch jazz players, including: Arturo Sandoval, Mike Stern, Dennis Chambers, Tom Kennedy, Teymur Phell, Sanah Kadoura, Taco Gorter, Robin Koerts & Kiba Dachi. It is Preda’s life ambition to expose the world to this glorious instrument and to bring into focus its history and cement its place it the jazz canon. That’s the short of it! Wonderful compositions and arrangements that are played by a burning band, led by Preda's formidable musical skills and techniques. How often do we get to hear a new instrument being introduced into the jazz world with such authority and dexterity? Bravo! Preda is something special, his music is positive and his playing (on a list of instruments) is outstanding. The intent of the project is to introduce us to the cimbalom, but the music and playing goes way beyond that, this is heartfelt and the energy is palpable. With a strong sense of the jazz language, Preda also adds elements of latin jazz, salsa, afro-cuban, arabic and of course the blues, to create a whirlwind of sound that is Mission Cimbalom.